Friday's Folly | Flickr - Photo Sharing! pugshiz, jaymce, bsii, and kellan added this photo to their favorites. these are damn cute elephants! is this a big piece? Yeah this is about a 20ft or so high wall at the back of my favorite beer drinking spot. oh my... i am having flashbacks. 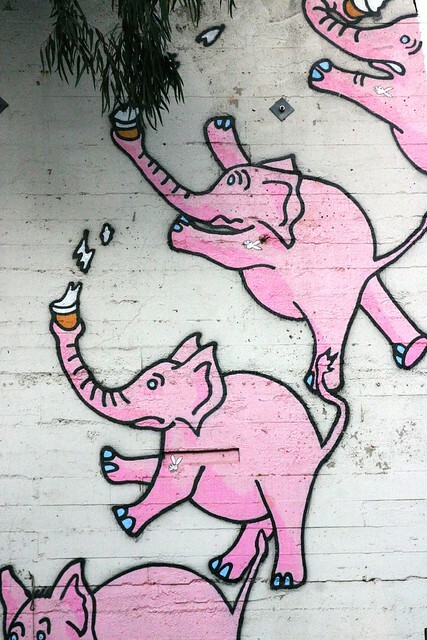 these elephants have always made me feel drunker than i was... uh, er perhaps it is just zeitgeist. love this yard. the best in sf.